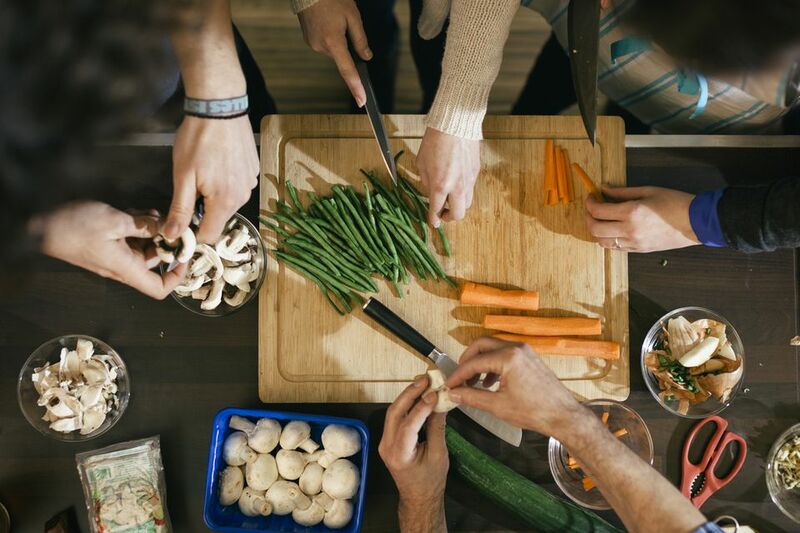 You don't have to have MasterChef-winning ambitions to enjoy a short break at a cooking school in the UK, especially when so many of them offer much more than culinary lessons. Some throw banquets at the end of the day or have their own restaurants, while others have beautiful kitchen gardens or surrounding countryside to explore. And there are those where you can stay the night in rooms, cottages, or converted stables. A full day in the kitchen often ends with dinner and a glass of wine so it makes sense to stay overnight and make a short break of it. Here are a handful of schools worth traveling for, recommended by Nick Wyke, founder of Looking to Cook, which is the UK’s leading cookery schools directory. The range of kitchen-based or countryside courses at this cookery school based at Southrop Manor in Gloucestershire includes hands-on experiences such as bread-making, cheese-making, charcuterie, and preserving. Those who like to go native can try foraging, butchery, and game. A strong emphasis on cultivation and locally sourced produce is inspired by the school’s own vegetable garden. The estate has five luxury vacation rental cottages, suitable for groups, families, or couples, all of which offer a quirky take on the grand English country house experience. The cottages have been renovated largely by local craftsmen using local materials. After you’ve hung up your apron, come sundown the nearby 17th-century ​​The Swan at Southrop on the village green has an award-winning restaurant and is within walking distance from the manor. The kitchens, redesigned in 2011, are fully equipped with gadgets, multi-function ovens, and a mighty four-oven Aga. One or two-day courses focus on themes such as baking, game cookery, knife skills, and bread-making. The vineyard is also open for tours or can be explored by guests at leisure, and the wines can be put to the test at the Cariad Restaurant & Bistro, which serves locally sourced Welsh food. To complete the experience, there is a choice of farmhouse accommodation, B&B studios—where vines creep up the walls—and vacation rental cottages based in renovated farmhouse stables. Cardiff is only 10 miles away, and for those seeking some sea air, the stunning ​Gower Peninsula is not much further. Eckington Manor pairs up the warm and winning combination of a state-of-the-art cooking school with a luxury bed and breakfast. The Manor is situated in Worcestershire’s fruitful Vale of Evesham in the middle of a 260-acre farm that supplies ingredients for the school, cookshop, and restaurant. Courses include bread-making, game, and fish, as well as Aga cookery. The courtyard is just a short stroll from the school and provides the setting for 15 boutique bedrooms with private bathrooms. Rooms are furnished with silk wallpapers, designer furniture, and large comfortable beds dressed in Italian cotton and topped with plump, Siberian goose down pillows. Features such as antler chandeliers, antique furniture, and exposed beams and brickwork lend a rustic country home feel to the five gold-star accommodation. Mid-week and weekend cook-and-stay packages are available. If you don't do a cookery course, you should still sample the cuisine of chef Mark Stinchcombe, who, together with his wife Sue as co-chef, runs the kitchens. In 2015, Mark was the winner of MasterChef: The Professionals. The Yorkshire Wolds Cookery school is on Highfield Farm, which is a working pig farm with accommodations. It has a well-equipped, pristine teaching kitchen. Graded courses reflect local and seasonal foods and include Yorkshire Born and Bred, Seasonal Entertaining, and the occasional opportunity to learn Michelin-standard techniques from James Mackenzie, chef-proprietor of the Pipe and Glass Inn, one of Yorkshire’s growing band of starred restaurants. The accommodation is simple and neat including six guest rooms, each named after a local village, and a three-bedroom vacation rental cottage overlooking the Wolds. Walk off lunch on one of several marked trails starting out from the farm. Nick Wyke is freelance writer and editor at The Times, where he is responsible for developing a range of creative and interactive content from commissioning food and wine video series, building communities through social media, and hosting live chats and Q&As with leading figures from the food industry. He produces Looking to Cook, an online guide to British and Irish cooking schools..